Record Store Day at a glance—including an interactive map that details the festivities at participating shops. If you spend much time in record stores, you've probably found yourself transfixed by an expensive, primo-looking copy of a rare or out-of-print LP—among the framed records on the wall at the Wicker Park Reckless, for instance, are a $119.99 copy of the Beatles' White Album and a $39.99 copy of Stockhausen's Gruppen für 3 Orchester 1955-57 / Carré für 4 Orchester 1959-60. Ever wonder where records like that come from? I recently decided to look for an answer to that question, not just because Record Store Day is this Saturday but also because there's so little new left to say about the "holiday" itself. How do stores come by the elusive treasures that collectors hunt for in thrift shops, yard sales, and the like? Sometimes, it turns out, they send people to record fairs. 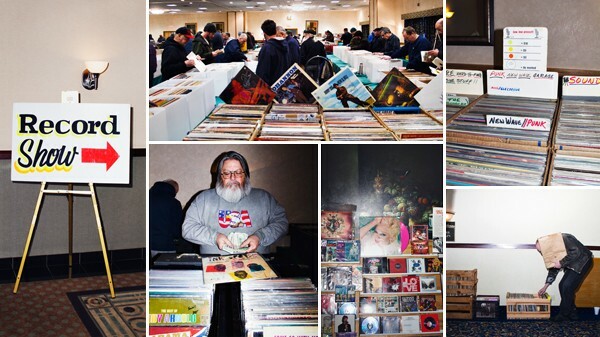 So last month I got up before dawn to join Permanent Records store manager Dave McCune on his trek to the Chicagoland Record Collectors Show at a Best Western Hotel in Hillside. Used vinyl is more than half of Permanent's stock, and shopping for it at shows like this is one way a store that knows its audience can beat the crash in sales of music on other physical media. Before I go further, I should say that my decision to accompany McCune arose from a coincidence, not because I wanted to make a special endorsement of Permanent—it's hardly the only shop in town to carry great used records, both rare and ubiquitous (and the Chicagoland Record Collectors Show has plenty of both kinds). I frequent lots of stores—Laurie's Planet of Sound, Saki, Logan Hardware, Reckless—and pretty much every time I go, I'll find an LP or seven-inch I never thought I'd see. Permanent is no exception. What happened was that in January I ran into McCune and Permanent cofounder Lance Barresi at the J&M Tap, a Ukrainian Village dive bar better known as the Secret Squirrel. We were all there to help Reader music-listings guy Luca Cimarusti celebrate his birthday. (In December, Permanent's in-house label released I'm Good to Drive, the debut LP from Cimarusti's newest band, Basic Cable.) 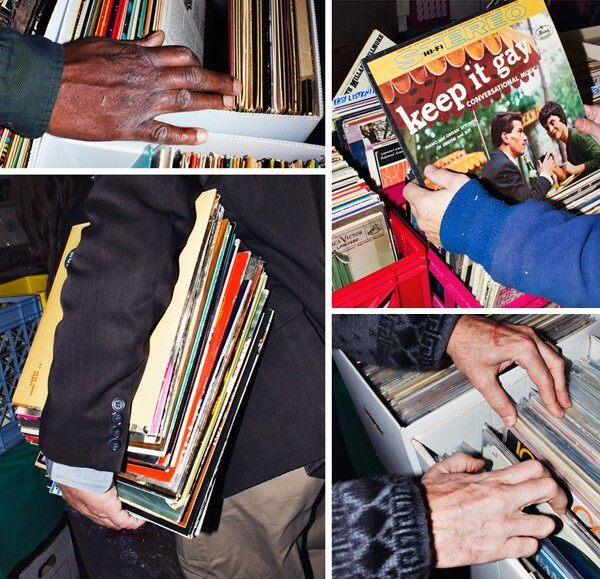 Mc­Cune and Barresi called it an early night, leaving around 11 PM so they could wake up before sunrise and head for Hillside—the Chicagoland Record Collectors Show has early-bird hours starting at 6 AM, though at that point admission is a princely ten bucks rather than the ordinary three. I asked McCune if I could tag along at the next fair—there's one every other month, always on a Sunday. Let's set the scene. Just before 5:30 AM on March 16, McCune swings by my apartment in a Zipcar, a red Mazda hatchback—he's not buying just ultra-rare stuff for Permanent but also perennial favorites to restock its used-LP selection, so he'll need that hatchback space. It's still dark out and Logan Square is practically deserted as we head toward the Eisenhower for a serene trip west soundtracked by Eno's Music for Airports. We get to the Best Western just before six. The show is mostly in a big, drab banquet hall filled with rows of collapsible tables, only about half of which are set up—dealers are still shuffling inside with boxes, bringing the cold air with them. 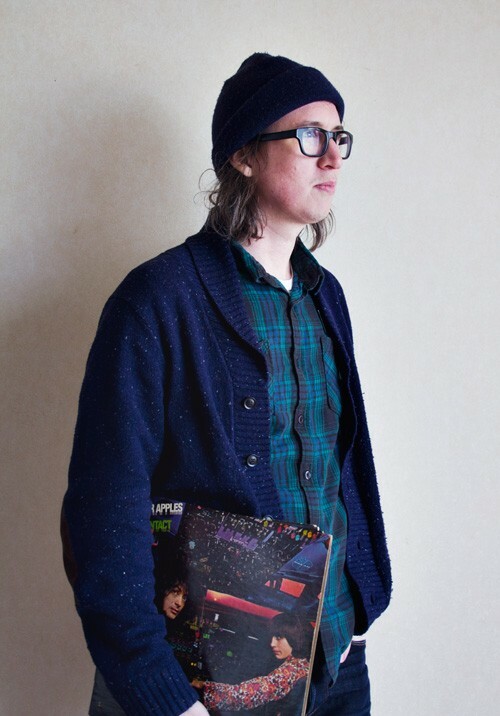 McCune starts flipping through rows of records and quickly gathers an armload of rock LPs. He passes on the 1970 self-titled debut by UK prog band If, which has a silver cover that always catches his eye. "I hate this. It's not a bad record, but every time I see it I think—gasp!—Silver Apples!" While he's waiting for the dealer to total his purchases—a stack of vinyl about three inches high ends up costing $85—he moves on to the next table. Before long John Govi, a white-haired 66-year-old who's in charge of the Chicagoland Record Collectors Show, begins roaming the aisles collecting cash for early-bird tickets—many buyers, McCune and I included, walked in before 6 AM, when nobody was yet taking money at the door. Govi has been running record fairs since 1990, visiting shows around the midwest to recruit dealers. This hotel in Hillside has hosted fairs since the late 70s, and Govi has held his here since 1999—he says it's now the largest regular vinyl show in the midwest. "I just put that label and nobody pushed it—nobody argues with me," he says. "I'm not bragging." The March show has attracted 73 vendors—more than the 54 scheduled for last weekend's CHIRP Record Fair. They've driven in from all over Illinois as well as from Michigan, Indiana, Missouri, Iowa, Wisconsin, and Colorado. Buyers travel across state lines too, and Govi says some come from Canada, Europe, and Japan, which builds Hillside's reputation. Govi has had offers to move the show to a larger venue, but the hotel sits right on the Eisenhower, east of Interstate 294 and west of Route 12—he'd rather not move. "All roads lead to Hillside," he says. Around 60 people turn out for the early-bird hours, which end when the show proper kicks off at 9 AM. (After it closes at 4 PM, Govi estimates that total attendance hit 520 or so.) Dealers fill the banquet hall, a smaller space across from it, and an adjacent hallway; some have mini turntables so customers can hear the merchandise. (A few folks are selling CDs, cassettes, and even eight-tracks, but the vast majority of the stock is vinyl.) Early birds spend the most money per capita, Govi says, and from what I can see most of them are middle-aged white men who must have a lot of storage space at home—shortly before 8:30 AM, I see a guy headed for the parking lot, slowly and carefully dragging a four-wheeled orange metal furniture-moving cart heaped precariously with LPs. Most folks here are racing the clock and the other early birds, but McCune, who started attending the show with Barresi in 2010, has buying down to an art. He checks each piece of vinyl for scratches and warping and determines if its price is far enough below its resale value—a record has to be "great for the store," he says, for Permanent to pay more than half of its eventual sales price. "You can't buy a $40 record for $35," he says. "Once you factor in the cost of getting there, and once the records go back to the store, you have to price them, somebody has to clean them—there's a lot that goes into it." Thrill Jockey publicist Jonathan Williger is at the show too, having arrived before 6 AM with a couple coworkers. He first came to Hillside in fall 2012. "One of the things about these fairs that I've found is their surprising consistency—the same dealers have the same stock," he says. There's also a trick to planning your route from table to table during the early-bird hours: "You're gonna know which dealers are open for business and the ones you need to wait for." Some dealers have stellar reputations, and early on McCune gets a great spot near one that many early birds seek out for hard-to-find, rare, and expensive stuff. The dealer opens for business, and within ten minutes his boxes are picked over. Govi says his dealers get their stock all kinds of ways—about the only thing they have in common, judging from the ones I talk to, is that they won't go on the record with a reporter about their methods. I have plenty of fun, friendly, nerdy conversations with dealers, but once I mention this story, every single one of them asks not to be quoted. I guess truffle hunters are pretty hesitant to tell you about their favorite spots too. Thankfully Govi isn't so reticent. He says the most common way dealers get their stuff is by buying up record collections from ordinary civilians looking to unload them. That's what Govi does—he places ads in the Sun-Times, the Tribune, the Naperville Sun, and the Illinois Entertainer. Whatever he finds that he knows will sell ends up on his two tables at the Hillside show. Dealers also buy records from each other—in fact I see one snap up a zany-looking 1982 private-press record by Jersey prog outfit Crossroads called Lights in the Sky. I had my eye on that one, but I snoozed and lost. McCune can dig quickly and effectively, and he's good at adding up prices in his head as he goes, so a dealer can't overcharge him (let's assume by accident) by eyeballing a huge stack and guessing. He can haggle, and he knows which easy-to-find titles Permanent's customers reliably buy, as well as which rarer records justify the expense. "At this point it's kind of a snap-judgment thing," McCune says. "You go through tons of records you see all the time that aren't very exciting, that you can find anywhere. But the other ones—I don't know, I guess after you've been doing it long enough they just sort of reveal themselves. They kind of have a faint glow or something." By 7:30 AM McCune's messenger bag and arms are full of records, so he heads to the car to unload them. Because I'm new at this, everything has a faint glow to me—all the crates and cardboard boxes filled with thousands upon thousands of LPs, all the discount signs with their promises of unknown treasures—so when I head out on my own, I'm like a kid with a sweet tooth and a wad of cash in a candy store the size of a soccer stadium. I ogle seven-inches that are obviously too rich for my blood, among them a Muddy Waters single on Chess for $100; I don't even bother to note the prices of a Shangri-Las promo and a rare Chicago soul 45 by Brothers of the Ghetto. I spot some unusual releases, including a Monkees EP from the back of a cereal box (half off its marked price of $15) and a $70 Rolling Stones bootleg from the early 70s called Stone Relics, released by famous black-market label Trade Mark of Quality. Some of the dividers are marked with "genres" I rarely encounter in record stores—in one box, right behind "Adult Only X Rated," I find "Teeners." At another table, someone has a collection of "Popcorn Tittyshakers." The crowd starts to balloon at around half past nine, and it's now a bit less homogenous—there are more young attendees and some women, plus a few people who aren't white. I notice one guy flipping through a Rolling Stone Record Guide and another using a mini magnifier to look for imperfections on an LP. McCune finishes his shopping long before the fair ends—his third and final trip to the car is at 11:15 AM, and then it's time for us to leave. I head home with less than $10 of the $100 I came with, having bought (among other things) a live Jawbreaker seven-inch and an 80s glam LP by a Canadian group called Dragon Fly—I picked it for its hilarious cover, on which an ornate dragon printed in metallic gold ink plays its own tail like a guitar. McCune has picked up close to 200 LPs, all for resale at Permanent. (He avoids buying anything for himself—he says that's a "slippery slope.") Most are familiar titles by the likes of Talking Heads, Bob Dylan, Devo, Fleetwood Mac, Hawkwind, or Bruce Springsteen, but a few are worth more serious money—original copies of the Silver Apples' 1969 album Contact and the 1981 Chicago punk compilation Busted at Oz (which Permanent reissued in 2011) end up in the store at $74.99 apiece. He's even taken a chance on The Akron Compilation, a 1978 LP of Ohio protopunk that never came out in the States; it's seriously beat up, but maybe because it has a scratch 'n' sniff cover, Permanent sells it within a couple weeks. As we drive back to Chicago, though, McCune isn't thinking about pricing or resale margins. He's still collecting his thoughts. "It's kind of weird—it's like intensely watching a show, or focusing on this killer band performance or really intense movie or getting lost in a really good book," McCune says. "It's like right now, walking out of there, all of a sudden my brain is coming back to the rest of the world. When you're in there nothing else exists—it's just you and the records." The Reader's coverage of Record Store Day also includes an interactive map with details of each participating shop's in-store performances, giveaways, discounts, and more. Correction: This story has been amended to reflect the proper spelling of Jonathan Williger's name. Dave McCune, manager of Chicago's Permanent Records, reflects on the store's history: "I got to watch the evolution of the shop from both sides of the counter." Plus: Stefan Ponce brings a hip-hop who's who to the East Room, and Brittany Lee Moffitt drops her first solo EP.